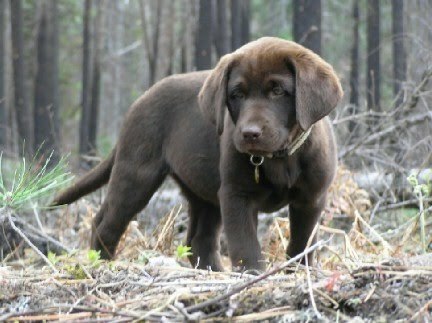 Litter of chocolate Labs due February 10, 2012. Contact: Dan Scollard 541.753.6861 or danscollard@hotmail.com. Please feel free to arrange to meet Jackie Brown prior to whelping, or to visit/see pups afterwards. 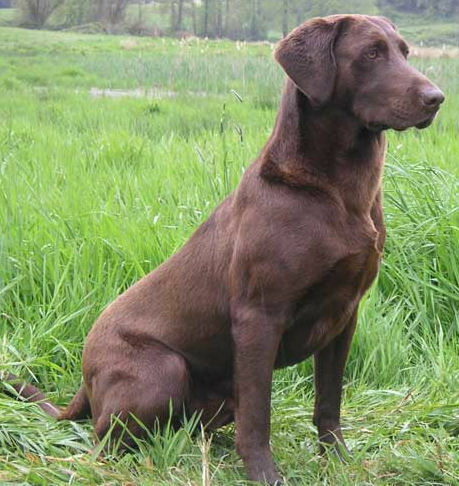 Pups: Pups will be sold wormed, with full guarantees on eyes, hips, and elbows, with dew claws removed (unless you stipulate otherwise), with first shots, having been exposed to water (weather depending), having been exposed to duck, pheasant, quail, and chukar wings. These pups will be whelped and raised for their first 4 weeks or so indoors receiving abundant human contact. This will be Jackie Brown's 3rd litter with Merganser studs. Jackie Brown X (Merganser’s Radar O’Reilly MH, WC x Ruby Mollisol Of The Camas Prairie). Hip OFA LR-170449G30F-PI (Good). Elbow OFA LR-EL36671F30-PI (Normal). Eyes Clear (2009). EIC Clear. AKC # SR26120702. CNM clearance #: LR-CNM10-216-F-PIV. 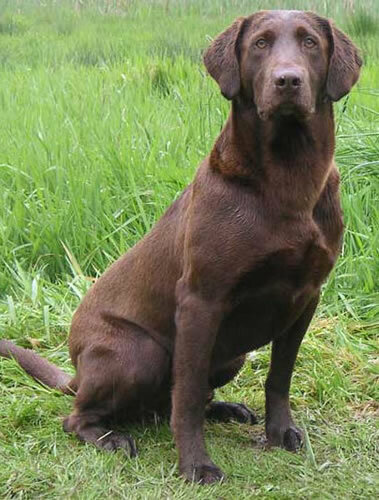 Jackie is a 6 year old, 70 pound AKC chocolate Lab who lives to be with her person and to hunt birds. She is an extremely devoted, happy, calm, and affectionate dog who lives indoors. She carries her own pack while backpacking and is an excellent guard dog at home. She is gentle with children, other dogs, and cats. 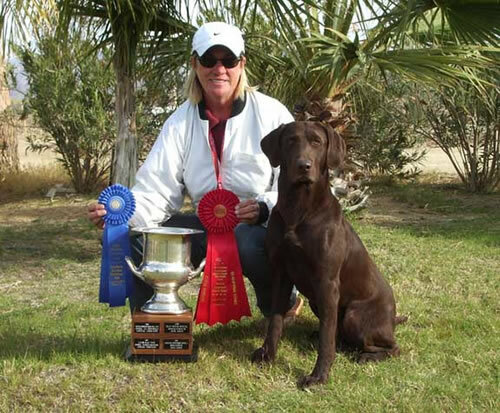 Jackie tirelessly hunts ducks, quail, pheasants, grouse, and chukar. She was very easy to train and enthusiastic throughout. She is steady to shot and takes hand signals and casting from a blind, from a boat, or while jump shooting in the field. She scent hunts upland and, not uncommonly, points. Jackie has the darkest brown coat of any chocolate Lab I have seen. 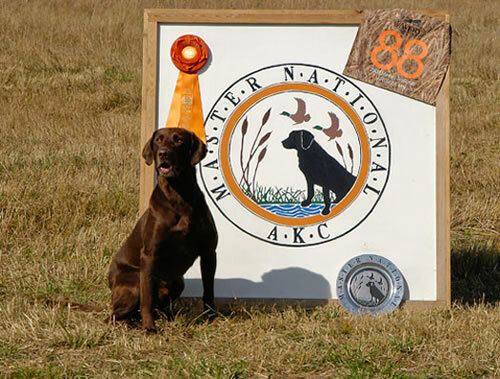 Her pedigree is very strong with Field Champion, Master Hunter, Junior Hunter, Companion Dog, Working Certificate, Best of Breed, as well as National Field Champion and other titles predominantly on her AKC Sire's side ( http://www.duckdog.com/mergansers_radar_oreilly_mh_pedigree.htm). Three of Bone's grandparents are FC-AFCs. FC Clubmead Head Over Heels is a full brother to FC-AFC DB's Cracker of Clubmead (Ritz). Smoky Hill Pepsi was QAA and lived until the age of 17. Pepsi's sire is FC-AFC Castlebay's Slew Man Two. No Fear's sire is FC-AFC Black Gold's Kates. Only two chocolates are in Bone's pedigree - one in the 4th generation and one in the 5th generation. This is a remarkable and important addition to the chocolate gene pool.